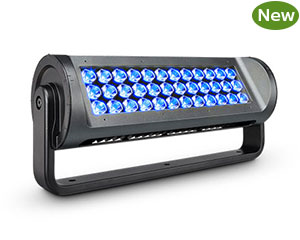 ReachElite IntelliHue is a premium exterior long-throw luminaire designed to light large-scale outdoor structures ranging from bridges and facades to monuments and skyscrapers. Powerful enough to hit targets over 750 ft. away, ReachElite raises the bar for delivered lumens in LED lighting. What sets ReachElite apart is its efficiency, high punch, and adaptability. ReachElite IntelliHue produces millions of saturated colors, pastels, and high quality white light, in the same precisely controllable luminaire, delivering the light exactly where you want it, making it incredibly efficient. Not only is there very little wasted light, but the delivered light has a high punch rate due to the custom optics and narrow beam angle of the luminaire. With a native beam angle of 2.6°, ReachElite introduces a new level of precision to the premium exterior LED luminaire market. ReachElite RGBW is a premium exterior long-throw luminaire designed to light large-scale outdoor structures ranging from bridges and façades to monuments and skyscrapers. Powerful enough to hit targets over 750 ft. away, ReachElite raises the bar for delivered lumens in LED lighting. What sets ReachElite apart is its efficiency, high punch, and adaptability. ReachElite RGBW adds a separate white LED creating better-quality whites compared to RGB, delivering the light exactly where you want it, making it incredibly efficient in terms of light distribution. Not only is there very little wasted light, but the delivered light has a high punch rate due to the custom optics and narrow beam angle of the luminaire. With a native beam angle of 2.6°, ReachElite introduces a new level of precision to the premium exterior LED luminaire market. ReachElite RGBA is a premium exterior long-throw luminaire designed to light large-scale outdoor structures ranging from bridges and façades to monuments and skyscrapers. Powerful enough to hit targets over 750 ft. away, ReachElite raises the bar for delivered lumens in LED lighting. What sets ReachElite apart is its efficiency, high punch, and adaptability. 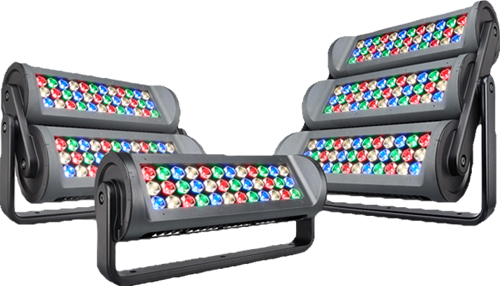 ReachElite RGBA adds a separate amber LED which expands the available range of colors to include warmer tones such as rich gold, yellow, and orange shades, delivering the light exactly where you want it, making it incredibly efficient in terms of light distribution. Not only is there very little wasted light, but the delivered light has a high punch rate due to the custom optics and narrow beam angle of the luminaire. With a native beam angle of 2.6—, ReachElite introduces a new level of precision to the premium exterior LED luminaire market. ReachElite Essential White is a premium exterior long-throw luminaire designed to light large-scale outdoor structures ranging from bridges and facades to monuments and skyscrapers. Powerful enough to hit targets over 750 ft. away, ReachElite raises the bar for delivered lumens in LED lighting. What sets ReachElite apart is its efficiency, high punch, and adaptability. ReachElite Essential White offers a single channel of white light in 2700 K, 3000 K, 3500 K, or 4000 K, delivering the light exactly where you want it, making it incredibly efficient in terms of light distribution. Not only is there very little wasted light, but the delivered light has a high punch rate due to the custom optics and narrow beam angle of the luminaire. With a native beam angle of 2.6°, ReachElite introduces a new level of precision to the premium exterior LED luminaire market. ReachElite Essential Color is a premium exterior long-throw luminaire designed to light large-scale outdoor structures ranging from bridges and facades to monuments and skyscrapers. Powerful enough to hit targets over 750 ft. away, ReachElite raises the bar for delivered lumens in LED lighting. What sets ReachElite apart is its efficiency, high punch, and adaptability. ReachElite Essential Color offers intensely saturated solid red, green, blue, or amber light, delivering the light exactly where you want it, making it incredibly efficient in terms of light distribution. Not only is there very little wasted light, but the delivered light has a high punch rate due to the custom optics and narrow beam angle of the luminaire. With a native beam angle of 2.6°, ReachElite introduces a new level of precision to the premium exterior LED luminaire market.